As one of the top 5 names in the industry players are well within their rights to demand big things from Coral, and they have been delivering the goods for decades. The company’s founder, Joe Kagalitsky, was a Polish immigrant who changed his name to Joe Coral after reading Coral Island; and his natural talent for bookmaking coupled with a flair for marketing saw his career flourish over 70 years, and make Coral the successful brand we know today. Their website is vast, covering every game type and betting category imaginable, and attracting the most reputable software developers in the business, NextGen and Blueprint to name just two. A healthy roster of Jackpots and Live Casino Games, plus the occasional instant win ensures that no player is left wanting. This is all wrapped up in a website that does business in a smooth, matter of fact manner with no unnecessary noise. 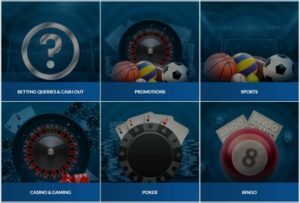 From humble beginnings on the streets of London, Coral has become one of the biggest names not just in online gambling, but in the betting industry as a whole. In fact, you will find at least one of their betting shops on the high streets of almost every town and city in the UK. There is nothing overly impressive about Coral’s site visually; a stock blue background and the familiar logo provide a uniform look throughout, and push all of the attention onto the game categories and the games themselves. This no-nonsense approach will be welcomed by those who don’t care for flashy distractions. One primary task bar holds (probably too many) main categories, with a side bar that adapts accordingly depending on where on the site you are, offering some well curated further categorisation options as well as a few Quick Links. Banking and My Account are located in plain view at the top of the page, with the My Account button revealing a brilliantly formatted run down of your activity and account details, as well as Customer Support options. Clear and simple. The Coral Casino is powered by Playtech, so all of the games within it are exclusively credited to the one provider. 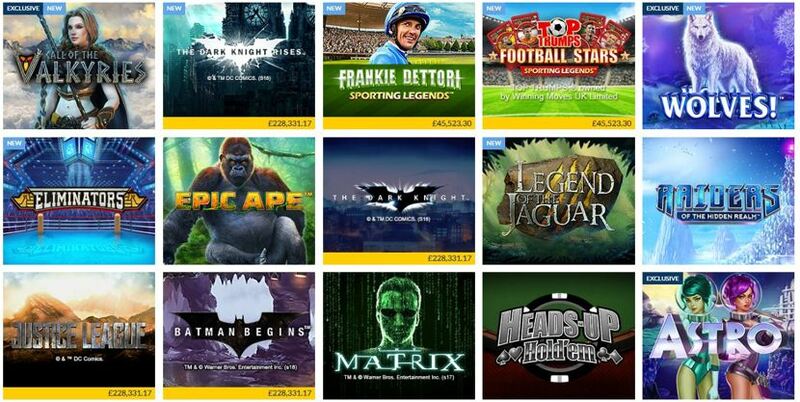 Never fear, though, as there is plenty more choice over in the Slots and Games sections of the website, with Barcrest, Microgaming, NetEnt and WMS being some of the bigger names available, plus some exciting Coral exclusives. 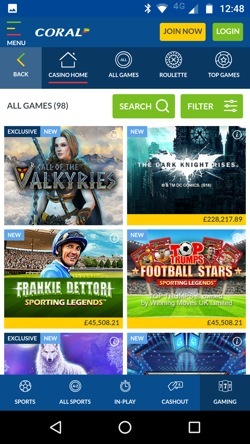 This is irksome, however, as you need to jump around the site to feel the full benefit of Coral’s game library, but on the plus side, the content on offer from Playtech is first class, and Coral have achieved a far more seamless navigation system than other online casinos in a similar position (sorry Ladbrokes). DC Comics fans, especially, will be in slot heaven. This back and forth is made much more palatable due to the site being lightning fast – there were a number of occasions when we didn’t actually realise the new page had loaded because it happened so quickly. Another benefit of stripping back the graphics. We should make it clear though that in-game graphics are as good as you will find anywhere else, and loading times come in at about ten seconds, which is brilliant since the whole thing is instant play. Slots – Throughout the site you will find around 350 slots from a string of well-known software developers, 59 of which are within the Casino and are thus Playtech titles. Zeus III could be right up your alley if you are feeling Godly, or if you fancy something branded you could take the red pill and dive into The Matrix. Live Casino – The Playtech powered Live Casino contains just short of 50 games, but aside from Roulette and Blackjack you will only find Baccarat as an alternative. The lobby shows the latest results on all games which is a nice touch. Roulette – Good news comes in the form of 15 different Roulette variations in the Casino alone. Penny Roulette for the end of the month and Roulette Deluxe if you’re feeling flush. Table Games – Aside from the above you can try your hand (geddit?) at Heads Up Hold ‘Em, Casino Hold ‘Em and Joker Poker. More serious Poker fans will want to check out the dedicated Poker section of the site. Blackjack – Not too shabby with 10 variations is Blackjack. Buster Blackjack looks fun, as does Cashback Blackjack – but we bet you can’t say it quickly three times in a row. Jackpots – There are almost 40 Jackpots with a good mix of themes and some mouth-watering potential paydays. From Justice League and Superman II to Age of Gods and Gems Gone Wild. Gamers on the move can choose either the mobile site or the downloadable app to satisfy their needs, and both are a breeze to access. Both options reflect the desktop site in some ways, but by their very nature feel much more contemporary and in vogue. The Casino itself lives within the Gaming section on both products, so you won’t see it immediately. The design is functional and feels familiar while the mechanics won’t let you down, with the interface feeling responsive and loading times keeping us happy. The collapsible side menu grants access to the more practical stuff and you can mostly get to any part of the site from wherever you are, so you won’t need to spend ages tapping back. A good 200+ games are available for gaming on the small screen, including exclusives and Live Casino options, so you needn’t suffer by way of choice just because you aren’t playing on the desktop site. There are separate apps available for the Live Casino and Coral Vegas/Casino, but they don’t seem independent of the main app so you may as well just use that one. Coral don’t appear to be fans of upper limits for deposits or withdrawals, although they do state that really big wins will need to be handled case by case – which is fair enough. There are no fee’s, a good selection of all the favourite payment methods, and withdrawal times are quick or at least in line with what you will find elsewhere. Coral is a household name in the UK and one of the veterans of the betting world. Joe Coral was the man who started it all back in 1926, primarily operating betting pitches at racecourses and eventually opening a credit office in 1943. He was one of many who jumped at the chance to open high street betting shops with the new legislation in 1961, and from there the business really took off. By 1979 the company was known as Coral Leisure Group and had added restaurants, hotels and Pontins holiday camps (remember those?) to its empire. After a failed acquisition by Ladbrokes in 1998, Coral bought out Eurobet and changed its name to Coral Eurobet in 2000, only to be sold again to a private firm in 2002, then once again in 2005 for £2.18 billion, this time to Gala – and thus Gala Coral Group was born. They stayed this way for the next decade before Ladbrokes came knocking once more, this time succeeding in an acquisition that was finalised in late 2016. Since Coral are in the habit of being passed around, however, they were quickly acquired under their new name, Ladbrokes Coral, by GVC Holdings in 2018. Throughout all of this, though, Coral have retained their own individual identity, and today employ over 11,000 people and operate around 1,800 shops. In terms of their online presence, it didn’t take Coral long to cotton on to the fact that online gambling was going to mean big business when it first started gaining popularity in the late 90’s. Their own online offering came to be soon after and it has been going strong ever since, now based in Gibraltar and even developing their own exclusive games. There isn’t much to grumble about here. Very few complaints are registered against Coral and those that we are aware of have been handled well. The excellent Customer Support team no doubt deserve praise for that. The praise keeps coming because e-mails have been answered extremely quickly historically, and the team behind the Live Chat couldn’t be happier to help. The Live Chat also serves as an in-depth FAQ, so you may not need to talk to an operator at all, although it should be said that this doesn’t function as well as the rest of the site as it involves a lot of pop up windows. You also have the alternative option of chatting over the phone. The team work 24/7 too, so you will never be left out in the cold if you have a problem. In short, support is easy to find, quick to get hold of, and given in a friendly non-judgemental way. Coral do everything right here. Live Chat – You will have to go via the Help Centre to get there, but once you find that big green button you will be connected almost instantly if your experience is anything like ours. Phone – Free phone 0800 44 00 11 at any time of the day or night for an instant response to your query. @Coral – Extremely active Twitter account, although heavily focussed on Sports and not specifically for support. @Coralhelp does exist, but we think they may have lost the password as it’s dead.